Today’s review is an exciting one. After reviewing all of AlkaViva’s countertop ionizers, I’m bringing you my in-depth Delphi undersink water ionizer review. The Delphi ionizer is AlkaViva’s most premium model and like the other ionizers in AlkaViva’s H2 lineup, it comes with molecular hydrogen infusion. By the end of my review, you’ll know for sure if the Delphi is perfect for you. Is it in the same class as Tyent’s UCE-11 or Life Ionizers’ MXL-15? You’ll also find out if it’s better than Enagic’s Kangen Water machines. First, let’s go over the Delphi ionizer’s features. Why are ionizers made in Korea and Japan the best? When you purchase an AlkaViva H2 ionizer, you get one of the best water ionizer filters in the world. The dual-filter set is manufactured in the United States. AlkaViva has had its H2 series filters tested by an EPA-certified third-party lab for 172 known water contaminants. The filters had spectacular results. Virtually all contaminants were reduced by 99.9%. Of all the ionizer companies I’ve reviewed, AlkaViva impresses me the most with their filters. On top of that, when it comes time to replace your filters, you buy only the media and keep your plastic housing. AlkaViva did this to cut costs for you and reduce plastic waste. They’re the only ionizer company I’ve seen do this, and I’m sure others will soon follow. You can click here to see the full test results of AlkaViva’s H2 filters. Filter life is 1000 gallons, you’ll only need to replace your filters annually. AlkaViva uses silver and zeolite-impregnated carbon in its filters, which is the reason they’re able to remove all known water contaminants including VOCs, arsenic, and heavy metals to near undetectable levels. Overall, these are the best water ionizer filters I’ve seen, and they’re made in the United States. If you live in an area with particularly hard water, you may want to consider installing a whole house filter to extend the life of your ionizer filters and ensure there’s no hard water buildup inside your machine. Installing the Delphi H2 is a bit more complicated than installing an H2 countertop water ionizer. The video below shows you exactly how to install the Delphi undersink ionizer. If you don’t feel comfortable doing it yourself after watching the video, you can always elect to hire a local plumber to get the job done right. What I like most about the Delphi is you won’t have to go beneath the sink to change the water settings once the unit’s installed properly. You control everything right from the Delphi faucet and can adjust the alkaline water settings to your liking. Earlier in my review, I mentioned how it’s a good thing AlkaViva manufactures its ionizers in Korea. The reason is that only Korea and Japan have certification programs in place to ensure the ionizers manufactured there are medical-grade ionizers. AlkaViva has received the medical device GMP Certification. It’s critical to know you’re buying high-quality platinum-coated titanium electrode plates. The plates are the most expensive/important part of your ionizer. That’s why the more plates a machine has the more expensive it is. AlkaViva’s plates are made in Japan, the same place Enagic (Kangen) manufactures its plates. However, you spend $1,000s less on an AlkaViva H2 ionizer. 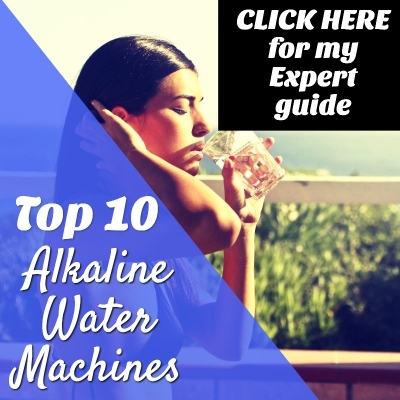 AlkaViva has been in business since 2002 and is one of the pioneers of alkaline ionized water in the United States. In other words, they know what they’re doing. AlkaViva has an A+ Better Business Bureau rating and has been accredited by the BBB since 2007. I have yet to see a negative review written about AlkaViva’s products or customer service. However, compared to other ionizer companies, they do have fewer reviews online. In my opinion, they’re a 100% trustworthy company manufacturing legit ionizers. It’s just as (if not more) important to research a company as it is to read customer reviews, especially since it can be hard to tell if reviews online are real. Luckily for you, I’ve already done all the research on AlkaViva, and I wouldn’t feature their products on my site if I didn’t believe in them as a company. I also like that the company started in Hawaii since it’s one of my favorite places in the world. Do I think the Delphi Ionizer is the best undersink water ionizer featured on my site? Well, that’s a tough call. I believe AlkaViva undoubtedly produces some of the best water ionizers in the world. If I had to choose the best undersink ionizer, I’d go with the Tyent UCE-11 overall because of the smartphone-inspired display and functionality of the machine. For those of you who want the most powerful under sink ionizer on the market, the MXL-15 by Life Ionizers is the one for you. I think the Delphi is the best choice for people who put reliability above all. AlkaViva has one of the lowest return rates in the business for a reason, and they stand behind their ionizers with a lifetime warranty on parts and 5-year on labor. The Delphi may not produce as wide of a pH range or as high a negative ORP as the MXL-15 or UCE-11, but it definitely gets the job done and more. The bottom line is I give the Delphi a big thumbs up 👍, and it costs less than both the UCE-11 and MXL-15. Buy the Delphi with confidence you’re putting your money into a legit company selling a legit product. Click Here for the best place to buy the Delphi undersink ionizer. You may also want to check out AlkaViva’s H2 countertop ionizers.